on the north side of the river, next to were that strange glass roofed restaurant used to be that has just been knocked down next to the suspension footbridge(phew, thats a mouthful!) theres a large plain cube like structure with a few vents in it on the road side. i've no photos of it, but next time your down there, have a look, its so obvious you'd miss it, but if you think about it, theres realy no reason for it to be there. and we get another summers use of the banks of the Clyde. I was near St Enoch at lunchtime and actually had a camera with me for a change, so I took a photo. 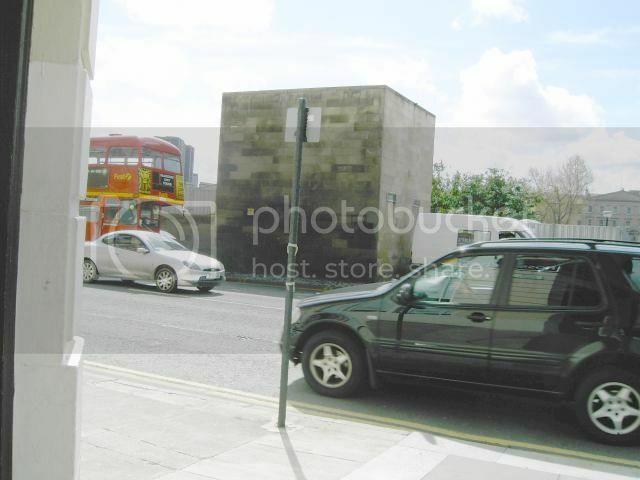 As pictures of traffic and poles go it's ok, as a picture of the desired building not so good ! Took it in a hurry as I was getting strange "gies yer camara" looks from some guys in suits (tracksuits) hinging aboot outside the nearby "Dial-a-house" bedsit place. that clears that up then! dont worry bout the bubble bursting, i didnt think it was anything too crazy, just thought it looked out of place thats all, and what with the steak house being knocked down, it doesnt look like it belongs to anything. Hang on a minute.. you sure that's Glasgow? I could swear that's a London bus in the pic! martin wrote: Hang on a minute.. you sure that's Glasgow? I could swear that's a London bus in the pic! I used to see that all the time when I worked in the Gorbals and I walked over the suspension bridge. Mind you thats when the place wasnt crawling with Jaikies and Junkies. used to see that all the time when I worked in the Gorbals and I walked over the suspension bridge. Mind you thats when the place wasnt crawling with Jaikies and Junkies. last time i was there, the jaikie was sitting with a berghaus jacket on - i can't even afford one of them! I walked by that way today, and despite the rest of the bar/restaurant being demolished months ago and "re-landscaped", that building is still there and they seem to have no intention of knocking it down. There was a gang of workies there knocking out the doors on the eastern side in readiness to brick it up with new matching yellow sandstone. I would have taken a photo but by the lack of safety gear I'd say some of these workies wouldnae want their photo taken for "security" reasons. Like kirky-guy I have also seen draymen delivering the beer down there when the restaurant was still open, but I can't help thinking it must serve some other purpose as well. I was over the suspension bridge yesterday. I think those guys are just trying to raise some money to pay the court fine they just got at the Sheriff! I also noticed some good graffitti down there that'll I'll have to photograph when it's not hoachin' with Glasgows criminal underworld and rowdy schoolchildren drinking Buckie on their hols. I delivered bevvy into that building years ago when I had a summer job for Morton Wines. It was the delivery entrance for at the time The Devils Advocate and Panama Jaxxs (thats how long it was, 1983 ish). There was a corridor connecting the the two pubs in the basement.